A leading member of the Czech early music scene. 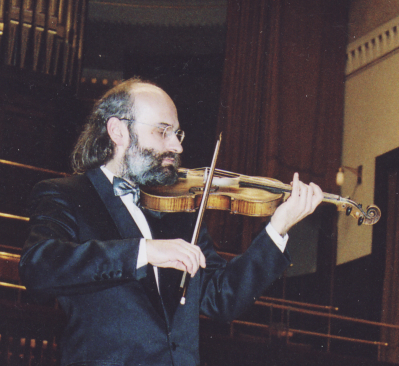 He studied modern violin at the Conservatory in Ostrava and the Academy of Music in Prague (graduated in 1988). He is the last pupil of Mr. Josef Sochor, inheritor of the old Czech violin school of O. Ševčík and J. Kocian, the initiate, who saved the tradition of virtuoso playing on gut strings from the big classical violinists. Already during his studies Václav Návrat became a member of chamber ensemble of Czech Philharmonic – the Prague Madrigalists, and this was only the beginning of his lifelong fascination for early music. Now, after years spent in archives, and by listening to recordings of early music, he is the favoured baroque violin soloist and leader of several ensembles. Besides the Ancient Consort Praha he formed the vocal – instrumental group Musica Divina Praga, Beethoven string trio and Vivaldi Orchestra Praga. With his ensembles he recorded about 25 CDs. Václav Návrat studied music composition privately. He is author of many arrangements, especially for stringed instruments. Václav Návrat also paints pictures and writes essays about music.